This week marks the fourth year of our travel blog, Postcard Jar, and we can’t thank you enough for following along on our journeys. 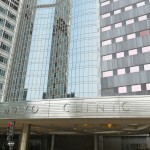 Since we wrote that very first blog post from the Mayo Clinic in Rochester, Minnesota, we’ve been collecting all kids of data and analytics to gauge the success of our blog. We’ve kept track of page views, Facebook followers, bounce rates, comments, shares, and retweets. But at the end of the day, we’ve come to realize that at least for us, the most important number of all is how many wonderful relationships we gained. Two of our favorite new friends, Reba Bueno and Joni Nash from the Pawhuska Chamber of Commerce in Pawhuska, Oklahoma. When we look back over the past year, what makes us the happiest are the trips we took with family, the new and interesting people we’ve met along the way, the readers we’ve inspired to go places, and the incredible opportunities we’ve had to partner with businesses, community groups, and destinations. We had a wonderful meal at a restaurant in Cozumel, Mexico. The Cocina Economica Los Chilangos is actually in the living room of some local residents. The truly authentic Mexican food is amazing and we really enjoyed the company of others at our table. Instead of giving you a detailed summary of our year of blogging by the numbers, we thought we’d share a few of our favorite travel experiences and a some of the relationships that have impacted us the most. 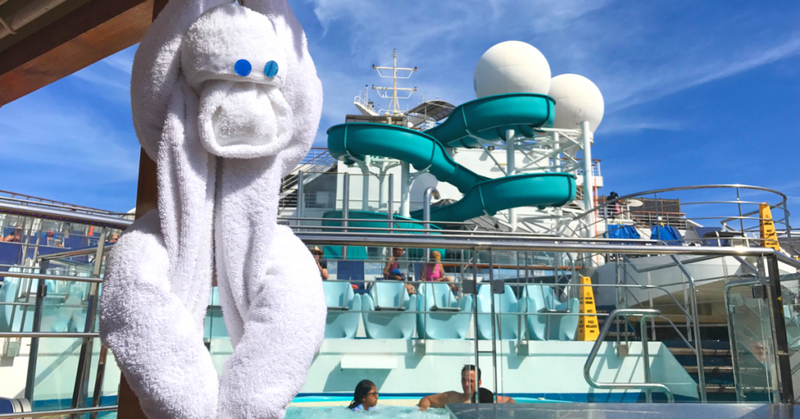 After Steve quit his job as middle school principal last summer, we took a wonderful vacation with our daughter, Meghan, through Kansas, Oklahoma, and Texas, eventually arriving at the port in Galveston where we boarded the Carnival Valor for a five night cruise to Mexico. It was wonderful for just the three of us to spend time together, reconnect, and relax after a grueling school year. Then, just one day after returning to our home in Crete and doing six loads of laundry, we loaded up a 12-passenger van and took four young college men from our college ministry on a vacation to The Ozarks. We have really grown to love these young men (and many others from our college ministry) over the past few years and we counted it a real privilege and blessing to be able to take them on a family vacation, since their real families are far away. We took Meghan and four of the young men from our college ministry on a family vacation to The Ozarks. 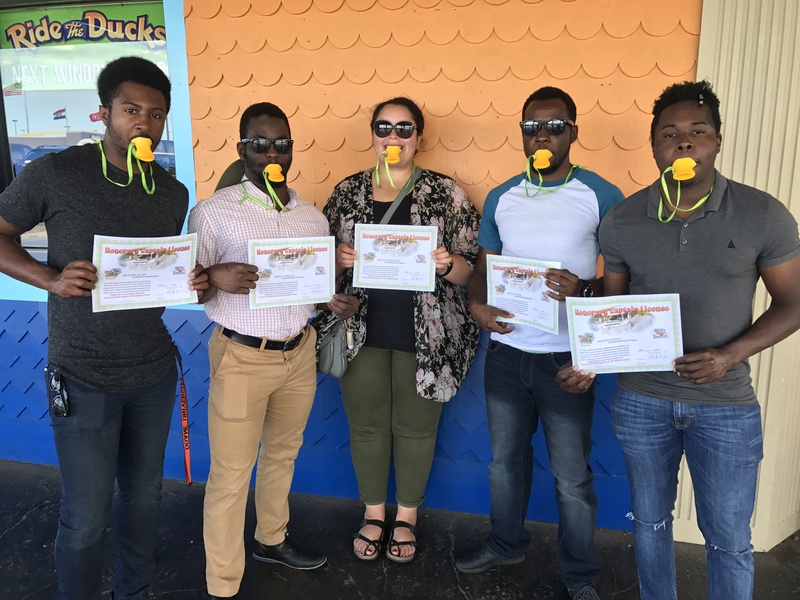 They loved the Ride the Ducks tour and all of them got their licenses to drive the duck. We also took an end-of-summer trip with Steve’s mom and dad across the Nebraska Sandhills. 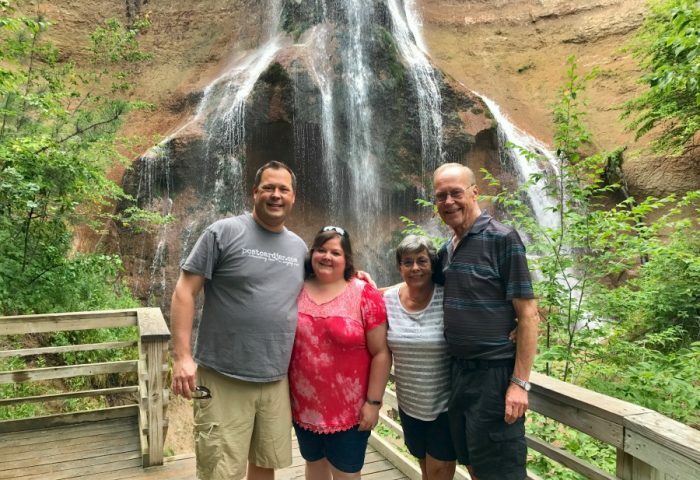 We enjoyed the relaxing time we spent with them, exploring new towns and places while admiring the incredible scenery that a drive off the beaten path of Interstate 80 provides. Because of busy work schedules in the past, our time with Steve’s folks has been somewhat limited and it was great to have these experiences with them and the memories that will last a lifetime. We had a wonderful trip around Nebraska with Steve’s mom and dad this summer. Here we are at Smith Falls near Valentine, Nebraska. After our Nebraska adventure, we returned to Crete just in time to prepare for our hometown’s celebration of the total solar eclipse. We sold t-shirts and postcards that weekend and invited friends and family over to share the experience with us at our house, which was right in the path of totality. Fellow travel bloggers Sara Broers of Travel with Sara and Tim and Lisa Trudell of The Walking Tourists also joined us, which was so much fun! Lisa Trudell (and her husband, Tim of The Walking Tourists) and Sara Broers of Travel with Sara have become good friends. 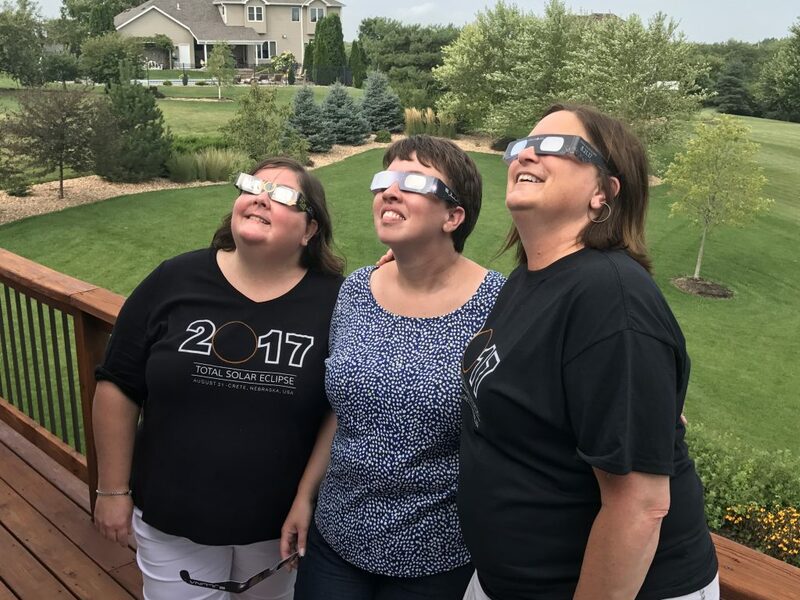 We were thrilled that they traveled to our home in Crete, Nebraska, to watch the total solar eclipse with us. Along with our parents, college ministry students, and long-time friends, we also had a few new friends we met that weekend who joined us on our front lawn to view the moon crossing over the face of the sun. 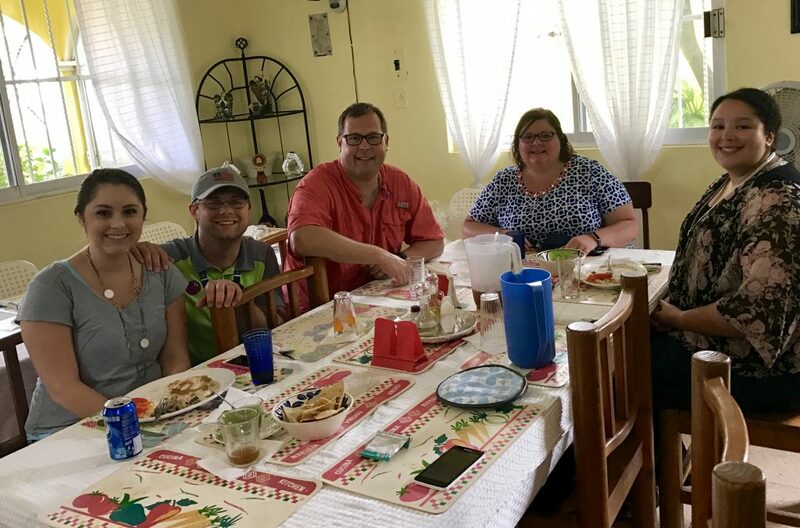 I’ll never forget introducing our new Canadian friends to Nebraska sweet corn (served from a cooler full of hot water with a thin layer of butter at the top) and sharing the experience with others from far away places like Sri Lanka and St. Kitts. 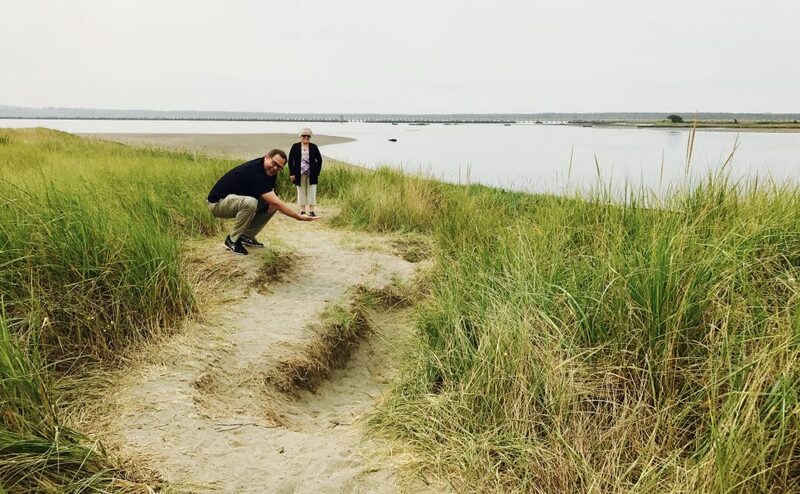 We had such a good time with Ann’s mom, Carol, on a trip to Oregon to see the coast and watch the Nebraska Cornhusker football team play the Oregon Ducks. 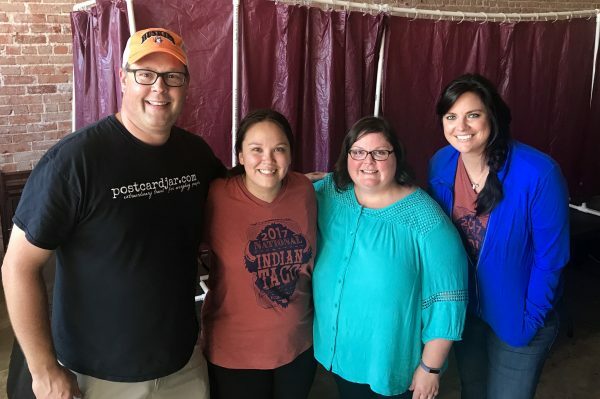 In the fall, we took my mom on a trip to Oregon for a Nebraska football game and a little Pinot Noir tasting before heading back to Pawhuska, Oklahoma, to judge the National Indian Taco Championships there. 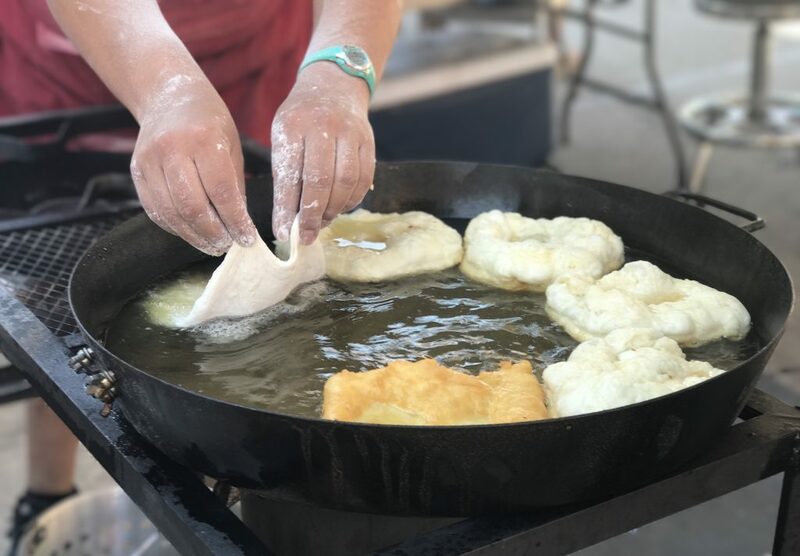 That trip back to The Pioneer Woman’s hometown was the start of many wonderful relationships with so many new friends there. The Pawhuska Chamber of Commerce had invited us to be “celebrity” judges for the contest. When we called them back to say we weren’t really celebrities, they responded, “Well, you’re celebrities to us!” and they welcomed us with open arms. We enjoyed our time in Pawhuska and were made to feel a part of the community by everyone we met. We loved Pawhuska so much, we took our moms back a few weeks later to visit The Pioneer Woman Mercantile and explore the town a little more. Needless to say, they loved it and we will always cherish that special time with our moms. 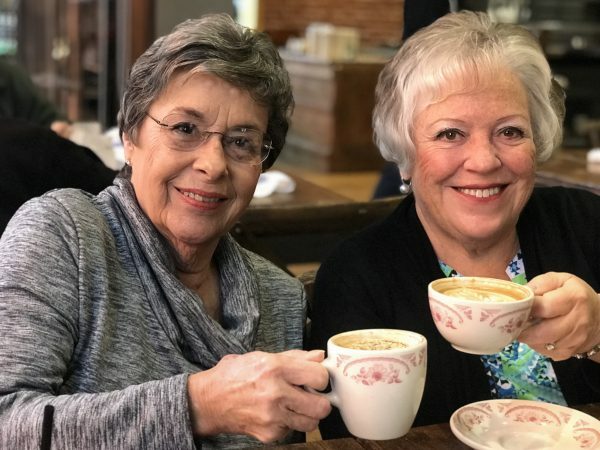 Our moms enjoy an expertly crafted cup of morning coffee at The Pioneer Woman Mercantile. Over the course of this last year, we’ve met fascinating people wherever we’ve gone and we’ve gotten to know so many of you through your comments. Your encouragement means the world to us and we’re so thankful you enjoy reading our blog. “OH MY GOODNESS! What a GREAT combination of personalities in the writing. I loved walking through Magnolia with you Ann as I live in Canada and it will be a LONG time before I am able to cross that off MY bucket list…and Steve..wow..I could hear so many men’s sentiments in your quips. We’re off to a very busy start this year, having just returned from a month-long trip to Kansas, Oklahoma, Texas, Mexico, and the Florida Keys. We’re at home catching up this week and then it’s back to Pawhuska for the Chamber of Commerce Gala and quick trip over to Tulsa to check out an apartment for our daughter, Meghan. She’ll be moving there this summer for nursing school and we’re so excited to this next step in her journey (plus, we just love visiting Tulsa). 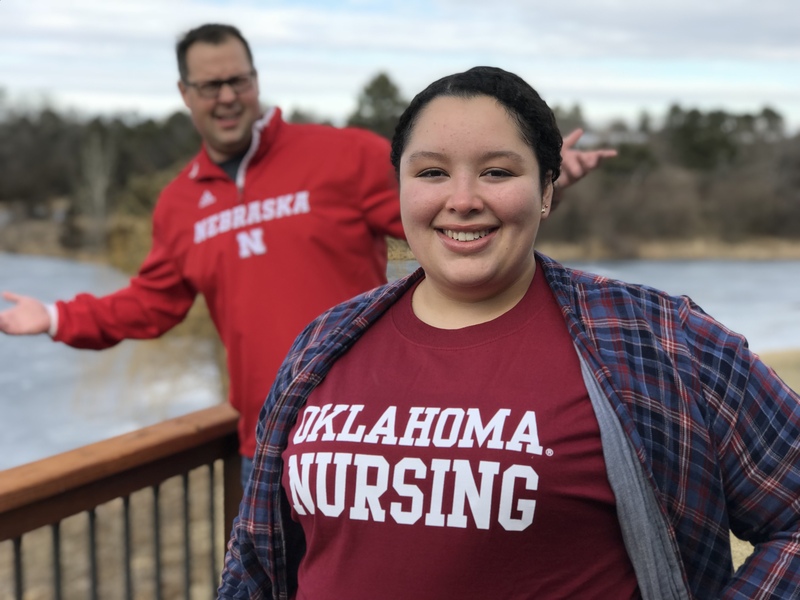 Despite being raised a Nebraska Cornhusker, Meghan will be attending nursing school at OU. We have several speaking engagements planned for this spring, including a talk on Social Media in Tourism at the Plains Safaris Conference in Kearney, and we’ll be making another trip to the Mayo Clinic in Rochester, Minnesota for some tests and follow-ups. 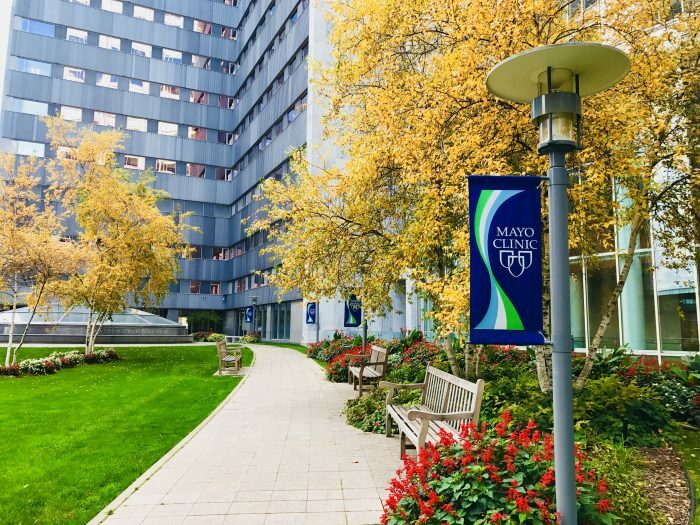 We’ll visit the Mayo Clinic in Rochester, Minnesota, this spring where Ann will have some more tests and meet with her doctors. May will be a busy month with graduations and getting Meghan moved and we’ve got a wonderful trip to Italy and Greece that we’re finalizing plans for this summer. It’s exciting for us to think about these plans, but more importantly, we look forward to the time with family, the people we’re going to meet, the stories we’re going to tell, and the many ways our words and pictures will hopefully inspire extraordinary travel for everyday people like us, and like you. Thank you again for coming along. And let us know what you’d like to see more (or less) of in our fifth year of blogging. We’d love to hear from you. I have enjoyed following you two so much! Keep up the good job and I can not think of a thing you need to change.